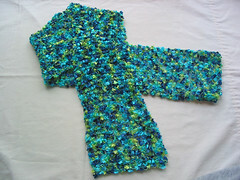 Thanks for the lovely comments about the baby sweaters! Tonight is the BASD meeting - I'm so excited! It's like looking up a bunch of noses. Notes: After a while I really liked this pattern. Enough interest with the bobbles, and then some "plain" rows to zone out. Twisted stitches were a little more work but look great! Steam blocking worked nicely; the edges rolled slightly before. I stretched a bit width-wise to open up the pattern. 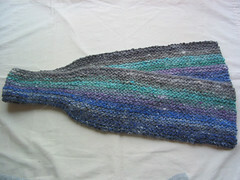 Final size is 4" x 56", a good length and style for folding in half and looping the ends through (if that makes any sense). I wasn't sure if the pattern would be too much done all the way through; I had considered doing a few repeats at the ends and then an occasional bobble here and there. I like it, though. If there's any interest I will post the pattern. 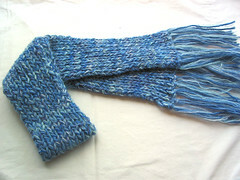 These scarves were knit earlier this year and are going out as gifts this holiday season. Maybe they're just the thing you were looking for! I included pattern info and notes. Notes: An easy pattern that kept my interest with all the short rows, was quick because it's all garter stitch on #10 needles, soft to knit, pretty colors, and only 2 ends to sew in. 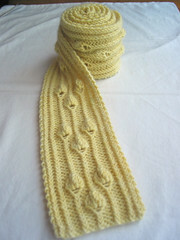 Shed a little while knitting. 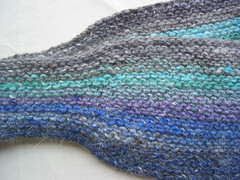 Notes: Ran out of Koigu first, and didn't want to buy more to make the scarf longer. 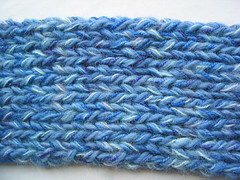 Quick knit and fun to see how the colors interact. Notes: This scarf sat on the needles for 3 1/2 years simply because I was using the wrong needles (Inox metal); when I tried bamboo needles in '04, I finished it in no time. Knitting with Flora was not so fun, felt very string-like. 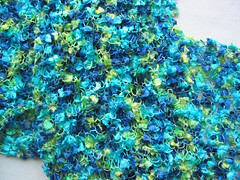 But, the finished fabric is soft and pliable, and the colors beautiful. 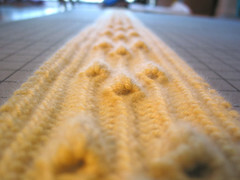 Pattern: Cast on 22 stitches; knit every row.